Collinsville High School student-athletes Greg Witte and Cristle Buckman recently signed 2019 National Letters of Intent to continue their academic and athletic careers at their chosen universities. 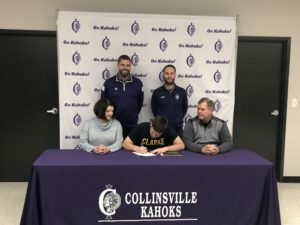 Collinsville High School Golfer Senior Greg Witte has signed a letter of intent to continue his academic and athletic career at Clarke University (Dubuque, Iowa). Collinsville High School Bowler Cristle Buckman has signed a letter of intent to continue her academic and athletic career at Lincoln College (Lincoln, Illinois). “Cristle has bowled for Collinsville Middle School and High School for the last 6 years. She has been on Varsity for the last three years and a starter for the last two. 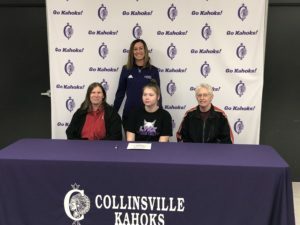 In the last 2 years she has been our high average for girls and will be sure to carry that success onto her college team,” said Collinsville HS Girls Bowling Coach Sean Hay.